William Roberts – a sadly under-appreciated man. Old Bill was a great bloke from what I can tell – genuinely self made, he was from a lowly family, but rose to the point where, when he died, his funeral was a civic occasion. 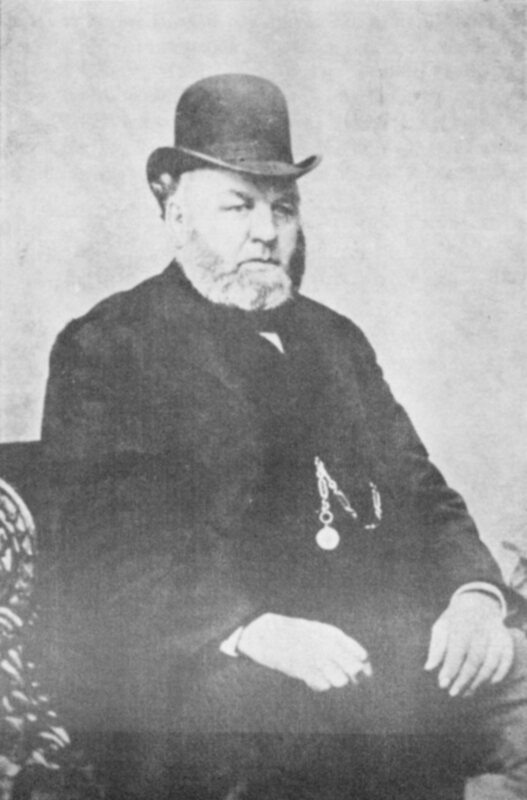 William Roberts – brewer, landowner, landlord, hotelier, magistrate, rogue and philanthropist was the father of modern Brownhills. Yet there is no statue; no road bears his name. No civic reference is made to a great councillor and civil benefactor. The man who donated the resources for Brownhills Fire Brigade is only recorded these days in the etched glass of a couple of his former pubs. This is a travesty, pure and simple. But more of that later. For now, the best way to appreciate William Roberts is by reading his history and his story; however, my heckles were raised by an article appearing in the April 1990 Brownhills Gazette, which I posted here last week. In short, the article seemed a bit fast and loose with the Actualité. Formerly, I posted here the obituary for the respected gent, and it’s worth a read. Now, local history rapscallion Peter ‘Pedro’ Cutler was also surprised by the Gazette piece, and wrote the following article. I’m hoping it will inspire debate: later, I will feature here what noted local historian Gerald Reece found out about William too. Thanks to Peter for kicking this off again; yet another great article from the Brummagem lad. Controversial… From the Brownhills Gazette, April 1990. Click for a larger version. On reading the article concerning the ‘History of the Station Hotel’ appearing in the April 1990 edition of the Brownhiils Gazette, I became puzzled by some of the assertions. It may be yet another example of how oral history can sometimes can get mixed over the passage of time. From this we can see that the Hotel existed before 1860, when William Roberts and his wife Ann came over from Tower Hill in Birmingham, and at that time belonged to the Harrison family. However, I cannot see it mentioned in White’s Directory of 1834. This could show that the Inn, by its naming, was indeed built around the time of the railway construction. Also looking at the Blog article ‘Anyone Fancy some detective work?‘ it can be seen that in the 1861 census the Station was occupied by the Big Man, and was situated at the end of Harrison’s houses. There is a male servant residing at the Inn and therefore it would seem strange that William’s wife would take in washing. As the Harrison family entered into coal in 1850, with the acquisition of the lease of Brownhills Collieries, it may be that the Inn was built around that time, as this coincides with the opening of the railway in 1850. However, Harrison took over the lease from William Hanbury, and with the lease came some houses. William’s father was George Roberts and his wife Mary. George had moved to a farm at Brownhills where William resided before going up North, and maybe it was this Mary, his mother, who took in washing? I would guess that the Inn was purpose built along with the houses, and originally Harrison would have used it as a place for the miners to spend their tokens. What a find! An excellent piece of William Roberts ephemera bagged by reader Steve Cottle. William eventually purchased the Station and could then add buildings and build up his brewing concerns, but it is unlikely that he actually built the pubs in his portfolio, more likely he bought existing concerns. It is probably true that in time the Hotel was frequented by the elite of Brownhills as on the 16th Sep 1871 the Tamworth Herald says that William Roberts’ application for renewal of licence at the Station Hotel came up for a second time. At the first Superintendent Hill had objected on the grounds that there was a large room that was used for musical and other performances, akin to theatrical performances. This time the licence was renewed. The subject of the adoption has been previously discussed, but I cannot find any evidence of a son? In March 1906 the Licence was transfered to his widow, and the management of the house would be under Mr George Roberts (probably his brother?). In November the Licence was transfered to Samuel Smith. This entry was posted in Brownhills stuff, Environment, Followups, Fun stuff to see and do, Interesting photos, It makes me mad!, Local History, Local media, Local politics, News, Reader enquiries, Shared media, Spotted whilst browsing the web, Walsall community and tagged brewer, Brewery, Brownhills, Brownhills local history, JP, Lichfield, Local History, Local politics, Pedro, Peter Cutler, philanthropist, Pubs, Staffordshire, Station Hotel, Things to do, William ROberts. Bookmark the permalink. 9 Responses to Trouble brewing? It wouldn’t be the legally recognised adoption as we know it today, if it happened, because legal adoption as we know it today didn’t kick in in the UK ’til well into 20th century. Nice one Pedro and Bob. Mr William Roberts at the end of his life he had quite an empire, and yet he was a charitable man towards the local folk of Brownhills. Mind you he must have been as sharp as a razor when it came to making money! Very intresting man indeed. Around about 1903 William Roberts gave just under £600 to charity, which included: Hammerwich hospital: Walsall hospital: Birmingham hospital, plus others which i can not recall of the top of my head. £600 was alot of money in 1903. William Roberts in May of 1899 presented each inhabitant of the BUDC area, that had reached the age of 80, the sum of 5s. This was to coincide with the 80th of Queen Vic. “Prior to the year 1730, publicans were in the habit of selling ale, beer, and two-penny, and the ‘thirsty souls’ of that day were accustomed to combine either of these in a drink called half-and-half. From this they proceeded to spin ‘three threads,’ as they called it, or to have their glasses filled from each of the three taps. In the year 1730, however, a certain publican, named Horwood, to save himself the trouble of making this triune mixture, brewed a liquor intended to imitate the taste of the ‘three threads,’ and to this be applied the term ‘entire.’ This concoction was approved, and being puffed as good porter’s drink, it speedily came to be called Porter itself.” -Quarterly Review, 1854.